Mark Barrett reports on how women's rugby is developing a foothold in Europe's newest country - Kosovo. “I see rugby as a community with open arms, with different people each with different role, playing together with dedication in the field. It is the first time in my life playing rugby and every day is a learning experience,” said Saranda Rexha, a member of the R.K. Qikat, the first rugby club for women in Kosovo. In Kosovo, rugby is a very new sport whether you’re male or female. Traditionally men played football, basketball and boxed, while the women, well, they mostly stayed home. According to one survey, only 15 % of women in Kosovo participate in any sport at all. Kosovo is a conservative society still rebuilding after years of conflict and a devastating war that resulted in over half its population becoming refugees. It is still the poorest country in Europe and this year Kosovo celebrated 10 years of independence. But recently Kosovo sportswomen have been breaking new boundaries with Majlinda Kelmendi, Olympic Gold medalist and world champion judoka, paving the way for a new generation. Now for the first time Kosovo has Qikat, its women’s rugby club, which currently focuses on Sevens. "Qikat" literally means "girls", though in Kosovo slang a more accurate translation would be "cool girls". The club began practicing in the capital Prishtina’s main park, Gërmia, in late November. Four women came out to the first session but slowly the team has grown to include local and ex-pat players. It now has a rough mix --50/50-- of local and ex-pats playing weekly. “I joined the rugby team of Kosovo because of my passion for sport, and also so that I can meet other awesome women from different backgrounds with whom I share common goals; empowerment, growth and - why not - winning” says Diellza Malazogu, from Prishtina. The team gives women a sense of pride, identity and passion that they can share with each other. “In my country, Kosovo, rugby is not very well known. I’m a marathon runner, and 2017 Kosovan 5000 Champion, and rugby has given me an opportunity as a runner. 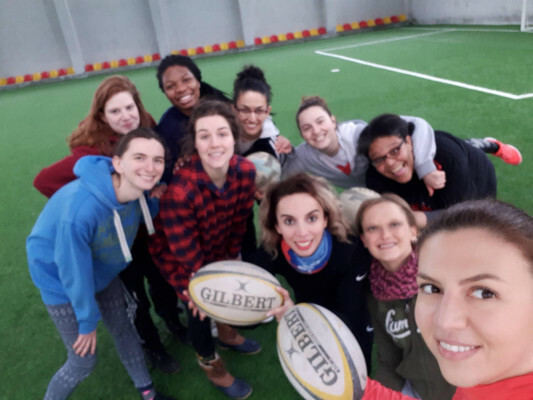 Rugby revitalized my passion for competition and gave me something to work for as I see a future for myself in the sport,” says Nebahate Maqastena “The Kosovo Rugby Sevens Women's Team at Qikat, and the girls who play with me, have changed my life. The important thing is how we play together. I believe we should all play rugby [because of] the passion for the game, the way rugby players respect other players, because there are positions for everyone, and the sense of pride ” Maqastena continued. Saranda Rexha adds: "What I like the most is the confidence that rugby gives you, it makes you realize that being strong makes you more beautiful not less; it allows women to play and to aspire to be what they want to be, and furthermore it's a sport where women show their true nature, [and can be] physically aggressive without hurting anyone".